Elegant and expensive, Old Angler's is an ideal destination for special occasion dining. 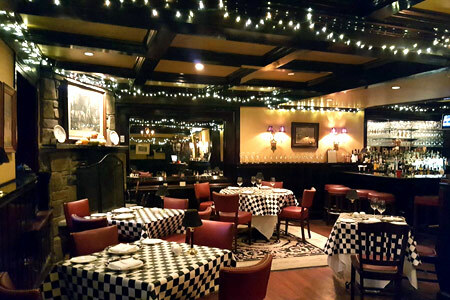 : A favorite of generations of Washingtonians, more for its location than its cooking, the Old Angler's Inn sits just across the road from the C&O Canal. In summer, the deck is about as picturesque as any outdoor dining spot in the Washington metro area. In winter, the ambience is made even cozier by the roaring fire in the downstairs sitting room, where you can have a pre- or post-dinner drink. Ingredients are good, preparations are simple and cooking times are near-perfect. Roast fish and meats are well executed. You might also consider ordering a tasting menu for the entire table. It might start with a Maine lobster tail with Thai curry sauce, continue with a silken pumpkin soup, followed by peppercorn-crusted tuna and rack of lamb and a hazelnut-chocolate cake for dessert.